OMAHA, Neb. 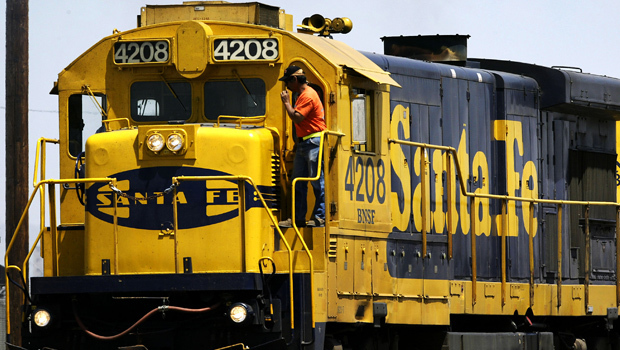 Warren Buffett's company recently discovered it owns two short-line railroads that it must sell because of its 2010 acquisition of the Burlington Northern Santa Fe railroad. Berkshire Hathaway (BRK.A) said in a letter last month to the Transportation Department's Surface Transportation Board that the BNSF deal should have been subjected to the board's scrutiny because two of its subsidiaries own the small railroads. The Surface Transportation Board reviews rail mergers, purchases, construction and rate disputes. It also oversees Amtrak's on-time performance. Officials of that agency appear satisfied with Berkshire's plan to sell the two small railroads by the end of the year, but Director Lucille Marvin said in a letter that the board is still considering whether further action is warranted. STB spokesman Dennis Watson said Tuesday he could not comment on the matter because it is still pending. Buffett's company didn't immediately respond to a message Tuesday. But in correspondence disclosing the problem to regulators, Berkshire officials suggest the company's size was the reason why the short-line railroads were overlooked until now. "Berkshire and BNSF have recently become aware that two of Berkshire's more than 75 operating business groups with nearly 2,000 subsidiaries do in fact have entities within their organizational structure that own or control an interest in a total of two rail common carriers," wrote Roger Nober, BNSF's executive vice president. Berkshire operates with a highly decentralized structure where Buffett and other top company officials have little input in day-to-day operations. And officials at Berkshire's subsidiaries don't necessarily interact with each other much. Before the BNSF acquisition, Berkshire sold its 9.6 million shares of Union Pacific (UNP) and 1.9 million shares of Norfolk Southern to avoid problems with regulators. Berkshire said it will work to sell the two small railroads quickly. Berkshire said its MidAmerican Energy utility subsidiary owns the CBEC railroad that brings coal over six miles of track to its power plant south of Council Bluffs, Iowa. The White City Terminal Union railroad that serves an industrial park near Medford, Ore., is owned by Railserve. That company is part of the industrial conglomerate Marmon Holdings, in which Berkshire has owned a controlling interest since 2008. Berkshire said the White City line is only 12 miles long and has two employees and two locomotives. It generates about $250,000 in revenue annually. Andy Kilpatrick, the shareholder-author who wrote "Of Permanent Value: The Story of Warren Buffett," said it sounds like Berkshire officials simply overlooked these short-line railroads. "I think it'll blow over the minute they get them sold," Kilpatrick said. Berkshire owns a variety of subsidiaries, including clothing, furniture and jewelry firms. Its insurance and utility businesses typically account for more than half of the company's net income. It also has major investments in such companies as Coca-Cola (KO) and Wells Fargo (WFC).